This video is a is a piece of performance art by Maya Escobar. As you will see, Maya is acting like a Jewish woman who has swallowed whole all the familiar anti-feminist apologetics . Telling us how spiritual women are and how men will get an upgrade once the Messiah's arrived, reminds me of Ramban's famous line from the "Disputation": "In our country, they say that he who wishes to tell a lie has his witnesses live far away," meaning that a fine way to prove a point is to bring evidence that's impossible to falsify. During the Disputation Ramban was speaking about the claims of Christianity, but the same can be said about the claims of Jewish anti-feminists. Just as its impossible to prove that Jesus defeated death and took the keys of hell from Satan, it can't be proven that being female offers any spiritual advantages. What can be proven, however, is that Jewish woman are kept at a disadvantage, disadvantages Jewish women are asked to accept in exchange for invisible benefits they can neither see nor touch. Aside: At the end, the character Maya is portraying suggests that Jewish women who are dissatisfied with their back of the bus status secretly wish to be men. There's some truth to that, of course. Jewish women wish to be men in the same way that Jim Crow blacks wished to be white, meaning they want the same freedoms and opportunities that are available to men. Though Judaism has made much progress in this regard, the RW and Ultra circles still run like MadMen. Telling women they're more spiritual, pat pat, run along, is just a way to protect the status quo. Reminder: There's nothing inevitable about the status quo. Its not written in the sky, e.g, that woman must not wear Tefillin, nor has a voice from heaven declared that women must use separate entrences or seat themselves at the back of buses. All of that is man made, and while in some cases you may be able convince me that there was nothing originally misogynistic about the rules qua the rules, the rules don't exist in a vacuum. If you look at how they are often enforced, and how they have influenced the ongoing development of our thinking about women, you can't conclude that they are benign. On the right, a woman's entire worth is often summed up with the phrase "She's such a tzanua"; on the left "strong supporter of Israel" is the phrase frequently used to convey the subject's true value. The right brokers no dissent on matter of female modesty. Only the strictest interpretations and applications are considered valid. LWOJ Jews are the same when it comes to Israel; There is no grey: Israel is always right. I'll conclude by letting you know that Leon Weiseltier has a new article in the Atlantic about the auto-da-fé Jews like to conduct against Jews who express heretical opinions about Israel. It's a wonderful piece, and the sort of thing every lunatic Zionist who visits this blog needs to take to heart. In brief, its high time they understood that we criticize Netanyahu and the IDF out of love, not self-loathing. We want what's best for Israel and for the Jewish people which is why we won't blithely and blissfully cosign everything the state and its leaders do in our name. According to the story, Jephthah is trapped by his own words. Before leaving for battle, he vows that the thing that greets him upon returning home from a successful campaign will be delivered to the Lord as a sacrifice. After the the Lord keeps his end of the deal and allows Jephthah to exterminate 20 towns, He pulls a little prank on our hero. Jephthah comes home after the bloodbath and is greeted by his own daughter. וכן אתה מוצא ביפתח הגלעדי, מפני שלא היה בן תורה - איבד את בתו. וכל הדברים האלה אמרה לו ולא שמע לה... עלה ושחטה לפני הקב"ה. ורוח הקודש צווחת: נפשות הייתי מבקש שתקריב לפני?! And all of these arguments [which the girl made to save her life] were ignored and he brought her and slaughtered her before God. And the Holy Spirit screamed "Do I desire that you sacrifice [human] souls before me? דעת רבותינו בזה ידועה. ואדוני אבי ז"ל פירש: "והעלתיהו" הויו במקום 'או' ופירש: והיה לה' הקדש, אם אינו ראוי לעולה, או העליתיהו לעולה. אם ראוי לעולה. וכמו זה הוי"ו של (שמות כ"א) "ומכה אביו ואמו מות יומת" – או אמו. ויפה פירש. וכן נראה מן הפסוק שלא המיתה, שאמרה ואבכה על נפשי. לאות כי לא המיתה... ...כי פרושה היתה... כך נראה לפי פשוטי הפסוקים. ודברי חז"ל - אם קַבָּלָה היא בידם, עלינו לְקַבְּלָהּ. The view of our Rabbis is well known, but my father interpreted it this way: the conjunction in the word "and I will sacrifice it" should be read as "or I will sacrifice it" so that the verse reads: whatever comes out of the door of my house to meet me when I return in triumph from the Ammonites will be the Lord’s, OR I will sacrifice it as a burnt offering If its something that can't be sacrificed (eg a camel or my daughter) it will belong to the Lord, but if it can be sacrificed (eg a sheep or a goat) I will sacrifice it. The conjunction (ie the vav) in this verse is just like the vav in [Exodus 21] where it says a man who strikes his mother OR his father will die. And this is a really nice reading as we see from the passage that she doesn't die... rather she was sequestered, and this is the plain meaning of the text. As for the words of our Sages if they had a Kabalah, we should accept it, too. (1) Radak rejects the interpretation of the Sages, telling us that the girl was not slaughtered. (3) He grounds this reading in pshat; however the interpretation of the Sages is also pshat based. The difference is that Radak is reading far more closely than the Sages are. However, both are taking the verses at face value. (4) At the end Radak makes a feint toward piety, likely to satisfy his fundamentalist neighbors, but its a very limited feint. Only if the sages had a Kabbalah, [ie, a person-to-person tradition dating back to the event itself] that the girls was slaughtered are we required to accept their reading. But if the Sages were merely reading and interpreting on their own, just as Radak is reading and interpreting on his own, we aren't required to accept their point of view. Eyewitness testimony in the form of a valid tradition that began with people who knew what actually occurred is binding; a guess based on your best reading is not. I'm sure my back and forth with Doug is boring many of you to tears, so let this be the last one. In what follows, I'll show you exactly how mendacious and dishonest his arguments are, and leave it to you to decide what's behind it: Is he unintelligent? Or does he imagine this serial mistreatment of the sources is a pious act in that it displays loyalty to some mistaken idea of "tradition?" Be sure you reach the end so you can see how utter and shameful Doug's defeat was. A - I provided a list of sources which clearly state that its ok to reject, contradict and disregard midrashim. (1) Being a haredi "tone-freak" Doug naturally objects to my use of those verbs in that he imagines they're inherently disrespectful, but I've been using them correctly. (2) He also claims that when the sources say "Midrash" or "Divrei Chazal" they don't actually mean that; rather they are describing something far narrower such as "things Chazal said about science that were wrong"
(3) While he conceded that Chai Gaon actually gives us permission to reject Midrashim, he denies that the others are. In fact he insists they aren't! (4) Also, Doug claims that the Ramban was lying when when he said, during the Disputation at Barcelona, that Midrashim are the invention of Chazal, and that we can deny them if we wish. B - In response to (4) point out that the the Ramban actually denies Midrashim in several places in his commentary, and give several examples. (5) Doug denies them all. He says Ramban never does this.Not once. Ramban says "There are divrei aggadah and they don't clarify the matter"
Ramban then offers another interpretation, an interpretation found nowhere in the aggadah. Those of us who speak English as our first language can easily describe what happened. Ramban has dismissed as inadequate [=REJECTED] the opinion of Chazal and replaced it with one of his own. Doug, loudly and obnoxiously, insists that no "rejection" took place, but what other word would you use? Chazal said "X" Ramban said nope that doesn't work because of the following reasons, and here's a better approach. What is that if not a rejection? Doug never tells us. D- For days, I've been the one doing the hard work of quoting actual sources, and making actual arguments while Doug has been taking it easy, calling us names, and suggesting no one in the universe is as smart as he is. Finally I demanded that Doug provide some sources. Luckily he complied. G - The book citations he provided in (D) were not from books Doug has actually read. (That's why he couldn't provide photos) They are all sources for the Hebrew essay Doug gave me, and cited by the author in his footnotes. Doug has never reviewed those sources himself. HE just saw them in the footnote and passed them along to make himself seem learned. Translation: This idea that the authority of miodrashim is limited can be found in the Geonim (plural) the Rambam and others! I - Remember how Doug got so bent out of shape (1) over my use of the word reject? Well here's his source! Please take note of this! I don't want to distract you from the arguments you're enjoying on the posts beneath this one, but I have another example of Ramban disregarding and contradicting midrash aggadah to share with you. "These are divrei aggadah, but they don't clarify the matter"
Ramban then proceeds to present his own reading of the verses, a reading that does not coincide with the Midrash's. As you know I strongly believe that there needs to be a reconciliation among the various sub sects of Orthodox Judaism. The differences between us, largely, come down to style, not substance. If we put aside our stupidities and hangups and allow ourselves to coexist in the same communities and the same institutions - in much the same way that Catholics of all levels of sincerity and devotion can attend the same churches and schools- we'll realize economies of scale and increase our political might, but that's not all: Diversity makes us stronger, not weaker. In a diverse community or institution you can't take things for granted. You have to to prepare better, to anticipate alternative viewpoints and to expect that reaching consensus will take effort. Diversity forces you to think and to double check and second guess your original ideas, by exposing you to unexpected interpretations and approaches. I believe in diversity because I believe in pluralism- and not because I am liberal with hippy ideas about peace, love and understanding. My devotion to pluralism is based entirely on my own self-interest. I believe that every person's perception has something to offer every other's. This belief flies not in the face of Jewish tradition but of recent Jewish tradition. When the Sages "accepted the truth from wherever it came" they were acknowledging that no one system - not Rabbinic Judaism, nor any other - can explain everything, they were being pluralists.When they wrote that קול ה' בכחו means that the voice of God reached each of us according to our own perceptions they were recognizing that each of us is a unique perceiving center, and that no subjective human is capable of capturing everything. You approach the truth from your angle, I see it from mine, and what we see is forever incomplete, but if we put our perceptions together we both draw closer to the reality. This basic fact of human nature is why I hold that revision, criticism and dialogue are far more relevant to truth-seeking than conformity to dictation from above. This is why I write the sort of posts I write. This is why I invite such a mix of personalities to guest-blog. And this, finally, is why I read blogs. In what follows, I provide my own modest recipe for reconciliation. Using the familiar "start,stop, continue" format of providing criticism, I offer some brief notes to each of the sub sects. To the extent possible, I have tried to identify the attitudes or behaviors that make reconciliation difficult, as well as those that make it possible, but the work is incomplete. Please fill in the blanks, or extend the exercise to other groups. Stop: Looking down your nose at anyone who isn't un-reflectivly Zionist/Pro-Likud. Continue: Giving huge sums of money to Hasidic and Yeshivish institutions. Stop: Mocking and attacking the sincerely held beliefs and superstitions of Jews who don't know any better. Start: Preparing your children to live in the world, and outside of the kolel bubble. Continue: Emphasizing the primary, non-negotiable importance of limud torah. Stop: Running to copy and embrace everything Hasidic at the expense of everything else the tradition has to offer. Stop: Treating the rest of us, and by extension the rest of the tradition, in all its diversity and variety, like its chazer treif. Start: Alllowing your children to learn English and vocational skills. The people spoke out against God and Moses, "Why did you take us out of Egypt to die in the desert? There is no bread and no water! We are getting disgusted with this flimsy bread!" "This flimsy bread" is a reference to the manna. Rashi cites the tradition that the Israelites were alarmed by the manna's four-decade defiance of a law of nature, namely: Everybody poops. Zabdi ben Levi said. "Two thousand cubits of manna fell every day, and it would last through the fourth hour. When the sun shone upon the manna, it began to melt and formed rivulets upon rivulets flowing down... Once it formed rivulets, the nations of the world would come to drink of it, but it would become bitter and acrid in their mouths, as it says (Num. 11): 'The manna was like a bitter seed.' But for Israel it became like honey in their mouths, as it says (Exod. 16): 'And its taste was of a wafer in honey.'" Since the nations of the world could not drink of it, as it was bitter in their mouths, what would they do? They would hunt a gazelle which had drunk from it, and tasting in them the taste of the manna that came down for Israel, say: 'Blessed is the people who have it so.'" This is a remarkable narrative. The manna would be wormwood to the non-Jewish palate if ingested "raw," but after being digested by the wildlife, it became delectable. Which is it, the bitter or the sweet? This is not a technical question about a miraculous food from a three-millennia-old narrative. The manna, "bread from heaven," has great symbolism, as it represents the Torah. At the conclusion of Exodus 16, the story of the manna, a jar of it is ordered to be placed "before the Testimony," i.e. the Ark of Testimony, containing the shattered First Tablets, intact Second Tablets and eventually the first Torah scroll, written by Moses himself. Exodus 16 also has the first mention of "Sinai," as well as the term "My Torah": "I will make bread rain down to you from the sky. The people will go out and gather enough for each day. I will test them to see whether or not they will keep My Torah." Rabbi Simon bar Yohai puts it bluntly in the Mekhilta: "The Torah was given only to manna eaters." So the question of how the manna tasted to non-Jews actually reflects dueling views of what Torah means for the outside world, nourishing or poisonous.This Midrash adopts both views: the Torah can be noxious to the nations of the world, but if it gets to them in the right way, they may appreciate its sweetness and benefit from it. One week ago, the vandals who set fire to the Church of the Multiplication of the Loaves and Fish at Tabgha, on the Sea of Galilee took the latter view to a vile and criminal extreme. The inscription they spray-painted, "And the false gods shall be utterly cut off," comes from the Aleinu prayer, traditionally attributed to Joshua at the fall of Jericho. In other words, this phrase expresses the views of the Israelites as they came into Canaan, a center of child sacrifice and other barbaric practices. To apply it to a house of faith which venerates Abraham, Moses and David is unacceptable. Isn't it time that we embrace the potential celebrated by the Midrash--that the taste of Torah and the Jewish tradition can sweeten and enrich all mankind, especially those of the Abrahamic faiths who share so much with us? As a Jewish and democratic state, Israel must not fail to swiftly bring to justice the perpetrators, nor can it countenance any violence of this sort, regardless of the faith tradition of the victims.
. Unfortunately, 43 of these attacks against churches and mosques alike have been carried out since 2009, with not one person prosecuted. That would be an affront in any case; but the lesson of the manna makes it a religious affront as well. Do we really want the nations of the world to taste only the bitterness of the manna? On this blog, I'm different. I'm louder. But my issue isn't "with people to the right of me," as some suggest. Its with people who deny facts, make stupid arguments, and have an incorrect view of science and history. As it happens, there is much more of this in RW Judaism, but I'm not quiet when I run into it on the left. Reconcile itself with modernity This includes many ideas, ideas the rest of the free world has largely accepted, but the most important of these is Freedom of Speech. Please note: I am not advocating some sappy, feel-good, pc-liberal ideal, wherein all ideas are equally respected. I am advocating the opposite: Open war on the bad ideas. And the way to do it is via questions, and arguments, and challenges to the received wisdom. If the received wisdom is right it will win the debate. If it is wrong, why cling to it? Truth has nothing to fear from free speech. Reconcile itself with the rest of Orthodox Judaism Wouldn't it be great if the masses and leaders stopped obsessing over over the correct way to eat a boiled egg? Nusach is irrelevant. Levush is irrelevant. 72 minutes vs 42 minutes is irrelevant. In fact, all of the petty and silly stylistic acquisitions Judaism has made over the last 2000 years are irrelevant. A guy is Jewish if his mother is Jewish, and it shouldn't matter one drop if his mother covered her hair, or even if she occasionally serves as cantor at the local WPG. I feel so strongly about this that in the first draft of this post, I demanded that Orthodox Judaism dissuade itself from the narcissism of small differences and reconcile itself to the rest of Judaism, but lets get our own house in order first. When lots of bad things happen to the same person in the sameweek, and he blames it on the window he blocked during construction, what fallacy is that? If you have a lawn it likely drives you crazy. You can either invest too-much time and and too-much money toward keeping it healthy and weed-free, or you can relax your standards and watch the dandelions, plantain and sorrel crowd out your grass. Did our forefathers have the same struggles? Probably not. In its natural state, a lawn has weeds; our ancestors probably knew this; also they lived before mass media. In 1915s, you weren't bombarded with images of perfect lawns and guilt-inducing promotional messages. If your lawn had weeds, so what? You could be chilled about it. Perfect green, weed-free lawns weren't on anyone's radar and no one drove themselves crazy over lawn care. Now, imagine Orthodox Judaism as a lawn. One hundred years ago, we were willing to tolerate "weeds." Every O Jewish child didn't have to get rammed into the same, square hole. Every O Jewish man didn't have to dress the same(1), and think the same (2) and talk the same (3). Every O Jewish woman didn't have to drive herself mad over skirt lengths. We were chilled about all of these identity markers. We allowed more variety in thought and deed. We didn't see diversity as a moral threat. (1) Try going to shul in your blue shirt and brown shoes. (3) I've been yelled at for calling a siddur a "book" Because, its a sefer, you dummy, and that's something completely different. Note: Obviously, this phenomenon gets worse as you move to the right, but I won't be tolerating any MO claims about how none of this goes on in their neighborhoods. For starts, the ordinary MO Jew can stomach exactly one position on Israel, viz., that everything Israel does it always perfect and right and moral and just, and you can dissent at your own peril. I understand why certain people insist on wearing hats and jackets when they pray. I don't agree with the reasoning - hats aren't considered business or formal wear any more, and lots of high ranking executives now go coatless - but I understand the reasoning: Once upon a time, you put on a hat and jacket to speak to an important person, and Judaism tends to ossify. We don't update our practices to reflect new realities. I also understand why some congregations demand that their prayer leader / chazzan put on a hat and jacket. Its an impulse that's not unique to Orthodox Jews. Many other Jewish denominations, as well as other religions, have congregations that prefer to have their prayer leader dressed in a particular costume. Even Orthodox Rabbis once wore“canonicals” (ministerial vestments) in Western and Eastern Europe, and you can still find an occasional Orthodox chazzan who likes to put on his funny hat for special occasions. But what I can't understand are the mindless compromises RW orthodox congregations make when it comes to chazzan attire. The other day, I prayed with a chazzan who was wearing jeans and a tee shirt, but to satisfy the congregation's sense of decorum he borrowed a jacket from one of the other members, and used a dirty, beat up loaner hat that that the synagogue keeps handy for hatless chazzans. The guy did not look dignified or respectful, nor did he look like anyone who was prepared to meet with a dignitary. So what was the point? I know that the general position is lo plug - any type of hat, including baseball caps are okay, so long as you're wearing a hat, but this is a corruption of the original intent. Our ancestors didn't force their chazzans to wear hats just for the sake of being yotse a (non existent) requirement to wear a hat. They did it because they wanted the chazzan to look nice! I've done posts with sources on this topic before, but here's an update. Keep it handy and be sure to use it the next time someone insists that Orthodox Jews are required to treat midrash as infallible. 1) Or HaChaim (Bereishis 1:1): You should know that we have permission to explain the implication of the verses after careful study--even when our conclusions differ from the explanation of our Sages. That is because there are 70 faces to Torah. There is no prohibition against differing from the words of our Sages except if it changes the Halacha. DB: Ayin panim l'Torah means that you can chose one that you prefer and disregard [="pay no attention to; ignore.] the one the Sages liked. DB:Any interpretation that Sages presented of a non-halachic verse can be put aside. You're free to replace it with an interpretation of your own if you wish. 3) Ohr Hachaim Devarim 32:1 Concerning Aggada it is permitted to offer explanations even if they contradict those of our Sages as long as they don't contradict the Halacha. DB: When it comes to aggada, (ie any non-legal statement Chazal made about any topic, including science and theology, which anyway were not considered separate categories until recently) you are free to contradict [="deny the truth of (a statement)"] Chazal. 4) Ramban on Vayikrah 12:2. He brings the Chazal that the gender of a child depends on which parent is "mazriah" first. He then quotes the Greek philosophers that everything in the baby comes from the mother except for hyly, the generative force. He then explains the pasuk according to the opinion of the Greek philosophers, and against Chazal. DB: Here Ramban demonstrates that he's not unwilling to use the principle he set down during his Disputation with Pablo Christiani. Though Chzal had a POV, expressed in their aggada, he rejects it ["dismiss as inadequate"] in favor of another idea. DB: If its in a Midrash we don't have to concern ourselves with it! 6) Ramban Genesis 8:4: This [Rashi] wrote on the basis of his calculations and its found in Berashis Raba. However, Rashi in some places minutely examine the Midrash and on the same verses provides a [contradictory] interpretative, so he has given us permission to do the same. 7) R. Yehudah ben Bilam of Toledo: ...if the words of the ancient [Sages] contradict the intellect, we are not obliged to accept them. DB: Use your brains people! You're not required to blindly follow Chazal where their words are self-evidently wrong. 8) R. Shemu’el ha-Naggid’s Mevo ha-Talmud: Aggadah is every explanation that comes in the Talmud regarding any matter that is not a mizvah. This is Aggadah; and you should learn from it only what arises in the mind.… What [the Sages] interpreted in [Scriptural] verses is [for] each one according to what occurred to him and what he saw in his mind. And according to what arises in the mind from these interpretations, one learns it; and one does not rely upon the rest. DB: The Sages interpreted the the Torah [ie created Midrash] according to whatever ideas struck them as most true; you're allowed to do the same. 9) Sefer Haeshkol: One should not rely upon Aggadah and Midrash, even though they are written in the Talmud, if they are unattuned or erroneous. For our principle is: One does not rely upon the Aggadah. DB: Does it get any clearer? One does not rely on the Aggadah. 10) Chai Gaon: Words of Aggadah are not like a tradition; rather, everyone expounds what arises in his heart — like ‘it is possible’ and ‘one may say’ — not a decisive statement. Therefore, one does not rely upon them. DB: Absolutely crystal! Aggada != tradition and you don't have to rely on it! 11) R. Yehִ i’el ben Yosef of Paris: Words of Aggadah, to draw the heart of man ... if you desire — believe them; and if you do not desire — do not believe them, for no law is determined based upon them. DB: Unless the man was lying this seems dead obvious: If you don't want to believe aggadah, then don't believe aggadah. It's fine! 12) R. Samson Rephael Hirsch: It is possible that some of [the stories in the Talmud and Midrash] were stated only in the manner of rhetorical invention [Heb. hamzִ a’at melizah], for some ethical or educational goal. And even if one says that the [apparently historical] stories of Avraham’s life with Terahִ and Nimrod in Ur Kasdim were a rhetorical invention — [we] should not reject [that position] with two hands. DB: Even the seemingly historical story of Abraham in the furnace might be an invention! Here are some basics for the readers who have astounded me with their ignorance over the last few days. Torah She b'al peh or Oral Law. Halakha LeMoshe MiSina: Ancient halakot which have no connection whatever with Scripture and can not be connected with it, thus deriving their authority only from the tradition which ascribes them to Moses on Sinai. Dibre Ḳabbalah" (Words of Tradition): Halakot found in the prophetic books. Some of these originated at the time of the Prophets; but others are much older, perhaps having been transmitted orally, and committed to writing by the Prophets. Dibre Soferim" (Words of the Scribes). Interpretations and regulations defining many written laws, as well as new halakhot, which the first scribes, beginning with the time of Ezra, formulated. Midrash Halacha Interpretations and regulations covering the written law, as well as new halakhot, which the Tannaim deduced from Scripture by means of hermeneutic rules or by logical conclusions. There are differences of opinion among the scholars in regard to most of these explanations and definitions; but they are of equal weight with the written law, and are called also"Debar Torah" (Regulation of the Torah). Hilkot Medinah: Statutes and regulations for which the scholars had no tradition or allusion in Scripture, but which they accepted as standards after deriving them from the customs and laws of the country in which they were living. Everyone agrees that (1) is part of the original revelation on Sinai. Everyone agrees that (3) (5), (6) and (7) were not part of the original revelation. Everyone agrees that some of (2) goes back to Sinai and some of it doesn't. The fun revolves around (4) Some of our great Rabbis thought that all of (4) goes back to Sinai. Others thought all of the rules of interpretation (which, oddly enough, are Greek in style and approach) go back to Sinai. Others thought none of it could be traced to Sinai and that all of it was produced by Chazal. We won't settle that dispute here and now, just be aware it exists. Aggada are the non-legal parts of the Talmud and compositions of Chazal that consist of stories, ancient science, magical remedies, theological doctrines, and the like. Midrash aggada are the non-legal parts of the Talmud and compositions of Chazal that are explicitly based on verses. Neither are part of the Oral Law because, by definition, neither have anything to do with law. Jews who wish to identify as Orthodox are required to accept and follow normative Orthodox halacha; however Orthodox Jews are not required to believe that the Talmud or that TSBP is a source of revealed truth capable of providing grounds for belief. As cited in the previous passage, our Rishonim and Achronim have already given us permission to reject the theological and scientific ideas presented in midrash and midrash halacha whenever those beliefs contradict out intellects. Also, in addition to the many quotes I have already provided, we have Samson Rephael Hirsh's famous denial of the infallibility of the Sages and the Talmud when they discuss non-legal matters. There are at least two big problems with the Orthodox Jewish* view of the afterlife. *By "Orthodox Jewish view" I mean the popular, mainstream opinion that involves some kind of reward and some kind of continued cognizance after death. (1) While I find the idea of it every bit as comforting as you do, I must admit there don't appear to be any grounds for the expectation that some great reward is waiting for us after death. For starts, the Bible doesn't mention it. In fact the good books bids us to keep the commandments not for the sake of the afterlife, as if we were Christians, but for the sake of this life. Again and again we're promised that following the law provides benefits in this world. In Tanakh, nothing at all is said about the next world. Moreover, no one has come back from the dead to reveal what awaits us. The whole thing sounds like a Santa-Claus story: Behave and you'll get a nice present. I hate to be a Grinch - and like, I said, I take great comfort in the thought the some part of us continues after death, and that all the wrongs will be made right - but I can't help but wonder why we're so certain the story is true. Where's the evidence? (2) And if some part of us does continue after death, the next question is this: how? My brain is the source of my mental life; my consciousness, emotions, and will are all products of neural processes caused by those coils of grey matter contained within my skull. When I make a decision, or walk across a room those are all physical events both caused and experienced by other physical events, namely the firing of my neurons inside my brain. In short, when the brain stops working, my thoughts and memories will cease to exist. So what part or me will continue into the afterlife? (2a) And I'll go one step further... even if you can somehow show me exactly how my thoughts and memories might survive after my brain stops functioning, you have one last puzzle to solve. Our minds work differently at different ages. Teen-aged DovBear was impetuous and ignorant. By the time I'm in my 80s or 90s all of "me" might be lost to a fog of dementia. In between, there were eras when I thought and acted in ways that were very different from how I thought and acted during other periods. Which "me" will survive my death? Demented 90 year old DovBear? Pre-blogging Dovbear who knew nothing about anything? Or one of the dozens of other DovBears? On the post below this one, there's an argument as to whether or not coercion is used in Hasidic enclaves like Kiryas Joel and New Square. 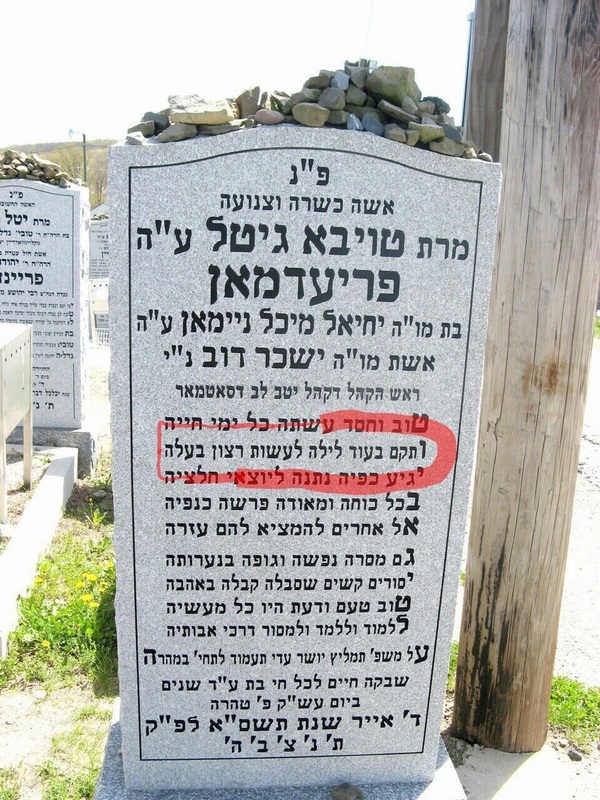 @DovBear @FrimetG In NS, I saw slashed tires and shattered windows for not honoring the rebbe for a bris. @DovBear @FrimetG Friend in W'sburg had his kids expelled from school b/c of rumors he had a rowdy Purim party w/ non-frum guests. @DovBear @FrimetG Guy I know in BP forbidden to step foot in Belz shul b/c of rumored things he wrote on the Internet. @DovBear @shdeen, jeez, let's see: my son was expelled from yeshiva, the only one in town, because I didn't shave my head. @DovBear @shdeen @FrimetG Forget KJ, I grew up in lukewarm Monsey, and was threatened with violence when our fishtank was mistaken for a TV. On the original thread, apologists for the Hasidim (and one imagines that they are either entirely ignorant or on the payroll) insist this is a simple case of no shoes=no service. Living in a heiliga place like KJ comes with certain obligations. Meet the obligations, and you get to stay. Fail to meet the obligations, and the natural outcome is an invitation to leave. No different from how a swanky club operates. What these apologists don't quite grock is that the "invitation" to leave is often accompanied by acts of violence, or social ostracism. In addition, you don't often lose everything - your children, friends and social and business networks - when a club tosses you out. - How can you say socialism is not a Jewish value? - If you oppose socialism how can you dream of the day when Messiah arrives to impose it on us? Kiryas Joel is a place that should remind the honest observer of Soviet Russia. All decisions are made by a central, unelected authority. The center is all-powerful (and ever increasingly powerful). Loyalty to the center is promoted as one of the highest ideals. The Rebbe and his circle, like Napoleon and the other pigs, are represented as a near-deities who do everything for the community - oy, the mesiras nefesh! - even as their own beds are feathered and their own bank accounts get padded. Cross the center and you risk exile, or something akin to a struggle-session - and more serious penalties are always a possibility. The people themselves rely heavily on the government to provide them with their needs. Kiryas Joel has the highest poverty rate in the nation. More than two-thirds of residents live below the federal poverty line and 40% receive food stamps. In the true spirit of socialism, the citizens of Kiryas Joel demand more and more from the government while their own sense of responsibility continues to shrink. Do they pay taxes or have any sense of civic responsibility, or is it just about what they can get? Do the people of KJ owe anything to the government, or to the (mostly) gentile tax payers who sustain it? If you're the sort of person who admires Hasidim, and believes that their way of life is authentic and deserving of emulation, doesn't it follow that you also admire the socio/economic system that keeps it going? And if you're the sort of person who thinks that we, ultimately, will become more like the Hasidim, doesn't it follow that you're dreaming of the day when King Messiah brings socialism to us all? *I realize these question only apply to the sort of people I describe in the last paragraph If you don't admire Hasidim you probably don't admire their economies or their totalitarian cult-of-personality culture either. T - Goodness [=Tov] and charity she performed all the days of her life. The fun starts on the second line where someone has modified a famous line of poetry. In which I compare a chazan to a horse. Pharoh-shmaroh. You want to feel the chills race down your back? Check out Secretariat's epic performance at Belmont 42 years ago today. The money moment is @2:28 when the announcers lets us know that Secretariat "is moving like a tremendous machine" as the horse activates what had to have been a rocket propulsion system and begins to move away from the field. Truly a remarkable performance. To give this post its Jewish angle, I invite you to consider the other-wordly Yisroel Meir Hefgott @38 below. Helfgot is so good here it's almost criminal. And if you take the time to listen to the rest of the concert you'll understand my Secretariat comparison. At this concert, Helfgot appears with other world class voices - every other performer is a super star - yet he just blows them away. He's Secretariat at the Belmont... a tremedous machine. Over the last few days we have been discussing wealthy people and their indulgences. Some say: let them do as they please. Its their money. They inherited it, or earned it or gained it via exploitation and robbery - whatever. The point is irrespective of how it got there, the money is now in their hands and none of us have any right to tell them what to do with it. Others disagree. Others say that power and responsibility go together and that the rich have an obligation to use their money to alleviate the suffering of the less fortunate (especially if they caused that misfortune - directly or indirectly while the wealth was being accumulated) To be sure, the mechanics are messy - how do we define luxuries? What is poverty? How can we be sure the people who need the help will actually get it? - but the principle is sound: If a child is drowning I must sacrifice my suit to save her. The things we don't need - luxuries like the suit in my example - should be traded to mitigate preventable evils. I think I'm on firm footing when I insist that the Sages* agreed with the second school of thought. In Pirkei Avos they teach that a world where everyone just does as they please regardless of how it effects the people around them is the world of Sodom. As I've said elsewhere, "It 's my money... I can do what I want... screw you isn't a Jewish ideal. When I approach questions like this, I find myself drawn to the utilitarian solution: The morally good action is one that helps the greatest number of people. But at the same time, I'm not some Robin Hood advocating that we rob from the rich and give to the poor. I agree that people have a right to be selfish boors if they wish to be selfish boors. I respect property rights and I'm skeptical of any bureaucracy's ability to solve anything. I don't want to live in a society (take note meshichists) where unelected officials have the power to curtail my freedom and my happiness for the sake of their idea of "good". Which is why I'm in such a quandary. 1 - We should sacrifice our luxuries and use the money we save to mitigate preventable evils. Some one who does not agree is exhibiting what the Sages called the character of Sodom. 3 - While these principles are sound, the logistics are vexing. How do we define any of the important terms? What is rich? What is poor? What is a luxury? And - crucially - if we deny wealthy people their luxuries will the economy fail, creating more despair than we've healed? ...and this is where I reach an impasse. Let's say you're walking past a shallow pool, and you see a child drowning. Do you have a moral obligation to wade in and pull the child out? What if you're wearing a $5000 bespoke suit and your favorite $500 pair of shell cordovan shoes? Are you obligated to ruin your expensive duds for the sake of the child? These are the sort of questions I asked myself while attempting to address the very complicated issues raised in yesterday's comment thread, to wit, in world where lots of people are still struggling to feed and clothe themselves, how much luxury is ethically acceptable? Today, the Times has a piece on how high-end watchmakers are adapting to the Apple smart watch, and it mentions a prince in Qatar who owns three, count 'em three, $200,000 watches. I think we can agree that it feels like there's something vulgar and immoral about this, but I'm having a difficult time formulating a rule that explains the ethical problem in universal terms. While it's easy to say that a prince who chooses a third $200,000 watch over a $200,000 donation to Tomchei Shabbos is just like someone who refuses to sacrifice his nice suit for the sake of a drowning child, how do we apply that understanding to ordinary first-worlders like us? All of us surround ourselves with non-essential luxuries. I don't own a trio of $200,000 watches, but I do own dozens of $30 shirts, and several $400 suits. Were those purchases as vulgar and immoral as the prince's? Thirty bucks go a long way in the developing world. Did I also choose a suit over a child? And if so, how do we formulate a rule that both defines luxuries and explains when they are acceptable? Chazal clearly believed that wealthy people have an obligation to alleviate the suffering of the poor*. We know what poor means, but what does rich mean? We have plenty of food, and plenty of clothing and access to medicine. Are we rich? Does this obligation to alleviate the suffering of the poor extend to us, too? And if it does, how do we define luxuries and decide which are ok to keep? * If rich Jews e are like wealthy American people at large, they are clearly falling down on the job. All this talk about white privilege sometimes confuses me. I'm white, of course, but I don't always recognize the advantages I receive simply on the basis of skin color. The matter becomes easier to understand, however, when I reflect on the privileges other groups receive. Take the rich, for example. Joe Moneybags and I live on the same block, and go to the same shul. * To quote the great Tom Tools, Joe was born on third base (rich grandparents and parents) and thinks he hit a triple. As a rule, I'm not jealous and I don't begrudge his wealth, but I do think its worthwhile to examine some of his privileges. A $50 contribution represents X of my disposable income, while X of Joe's disposable income is probably something like $10,000. When I toss $50 into the hat for an appeal or to help sponsor an event, I'm regarded as stingy. When Joe tosses in his $10,000 he's lauded as a hero and a great philanthropist -- even though we've made the exact same sacrifice. Joe's wealth allows him to attend more community events. He's at every dinner, wine tasting, brunch and parlor meeting. As as result, people think of Joe as a team player and he has access to business and social opportunities that aren't available to those who don't have as much money as he does. When other members of the shul are "honored"** by schools, Joe is always good for a full-page ad. This creates good will, and feelings of obligation. I know this is true because that's how I felt when I saw the ad Joe bought in my honor when I was "honored." Joe's father-in-law always gets an aliya when he visits. In part, this is because he makes sizable contributions to the synagogue, contributions that likely represent a smaller percentage of his disposable income than the contributions made by many of the rest of us. When Joe's kids come of age, he throws huge parties and invites hundreds of people. Lots of people = lots of presents; meanwhile, those of us who can only afford smaller parties aren't able to give our kids access to the same sort of boost. Now, let me be clear I have no personal issue with Joe. He's a great guy, who shares his money instead of sitting with it in his counting room. My only purpose here is to discuss and identify privilege. I'm not passing any judgement. * Let me say one nice thing about Jewish richies. When a gentile gets rich, he usually leaves his middle-class neighbors and joins his fellow richies in some secluded, gated community. Our richies stay in the neighborhood, and while they will usually poke out our eyes with some monstrous home renovation, they also continue to support our synagogues and to support and host events that make life a little more pleasurable. ** Honor, of course, is a complete misnomer. Unless you're mentally ill you don't find anything gratifying or pleasant about being "honored" by school. I think this is a good way to conclude our series on apophaticism. Check beck later for new material on a new subject. I'll tell of Your glory, though I have never seen You. I’ll give people images for You and names for You, though I do not know You. By the hand of Your prophets or through private counsel with Your worshipers, You provided images of the beauty and glory of Your power. They named Your powerful deeds: "Your greatness," "Your strength." They imagined You, but not as You really are. They tried to describe You according to Your deeds. They made parables about You and provided a myriad of visions of You, yet here You are, One in all the different forms. Your chief word is "truth"; You've called it out since the beginning. In each generation people interpret You [for themselves] and find [their own] meaning. As you can see, this piyut suggests that knowledge of God is unknowable and that all descriptions of God - even those acquired via prophecy - are parables, allegories and figures of speech. Now will you accuse the mystical school that produced it of skepticism? Will you say they were dry, and brittle and lacking in spiritually?